Sharing spring bags for After what seemed like a never-ending winter, spring seems to be arriving and I couldn’t be happier about it! I’ve been perusing my favorite online shops and buying some items for spring. As I’ve been perusing I’ve noticed one trend showing up everywhere: straw and bamboo bags! 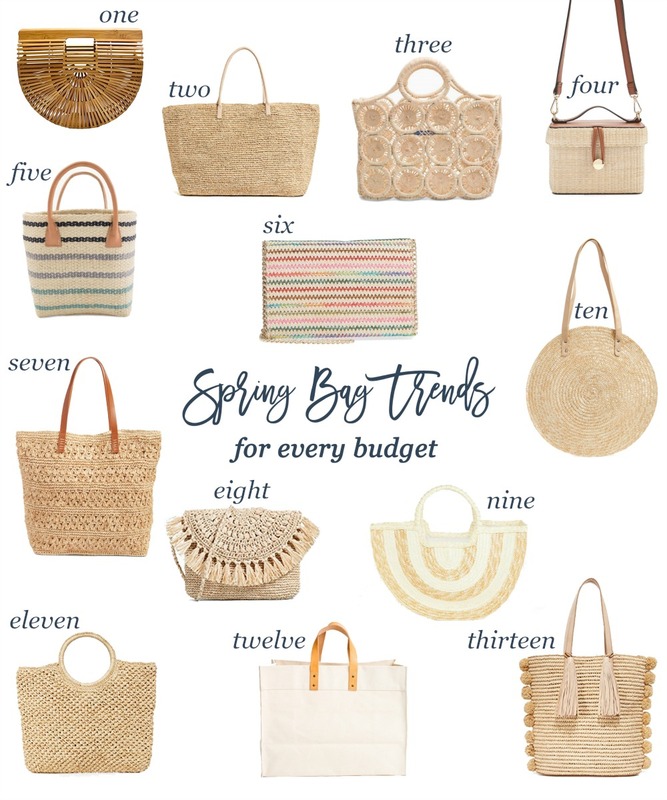 I always love a good straw bag in the spring and summer but I really like that they’re available at all price points this year. Today I’m rounding up a few of my favorites at all price points. A few are trendy “fun” bags, while others are tried and true spring/summer staples! It’s safe to say I really like all of them though *adds all to cart* haha! CULT GAIA ARK BAG DUPE (small size: $40, large size: $44) | The Cult Gaia bag trend is HUGE again this season. I think the bags are incredibly cool, but I can’t personally justify the price for a see-through bag that I won’t carry very often. There’s a dupe for this bag that’s great and only a fraction of the price. I bought the large size and for the price it’s a great bag. Obviously the quality isn’t as good as the real deal, but it’s a great option for this trendy bag! HAT ATTACK STRAW TOTE ($156) | I think I’ve featured this bag in one of my currently loving posts and I think I’m going to pull the trigger soon. I realize the price is a little steep for a straw bag, but this one is lined and has interior pockets, so it could easily be used as a beach bag or an every day bag during the warmer months. MACRAME TOTE ($96) | This is such a fun option for a straw bag! The detailing on this bag is incredible and would be perfect for a tropical vacation! It would look adorable with a silk scarf attached to it for a pop of color. SQUARE CROSS BODY STRAW BAG ($23) | First of all, you can’t beat the price of this bag! Second, I think this is such a cool bag for summer. Would be great when you just want to carry the essentials and need a more structured bag. Is it weird that it kind of reminds me of a picnic basket?! STRIPED STRAW TOTE ($110) | This tote is the perfect size for vacation or a night on the town during spring! The stripes add a fun detail and (although it’s not show in the photo) it has a really cute tassel detail on it too! STRIPED CROSS BODY BAG ($59) | Let’s pause a second to take in how freakin’ cute this bag is!!! Those bright stripes have me wanting to head to a warm destination ASAP. What I like most about this bag is the versatility. The bright stripes allow it to go with everything from a little black (or white) dress or a fun printed number. It can also be a clutch or a crossbody bag with the chic gold strap. RAFFIA CROCHET TOTE ($99) | This is one of those classic bags that can taken anywhere from a day at the beach or dinner by the water. It’s great quality and can hold everything you’ll need. It also comes in 3 other colors in case you want to make a fun statement. MIA CROSS BODY BAG ($48) | I have this clutch by the same brand and use it all the time during spring/summer but am always a little bummed because I’m stuck holding it all night. Well, my problems are now solved because it comes in a crossbody version now! This brand always has really high-quality items, so the fact that this bag is under $50 is amazing! HALF MOON STRIPED BAG ($40) | Such a fun bag for any tropical vacation. It’s fully lined and can easily hold a beach towel and all the essentials. CIRCLE BASKET TOTE ($49) | Circle totes are a big trend for spring, but some of them can run a few hundred dollars. 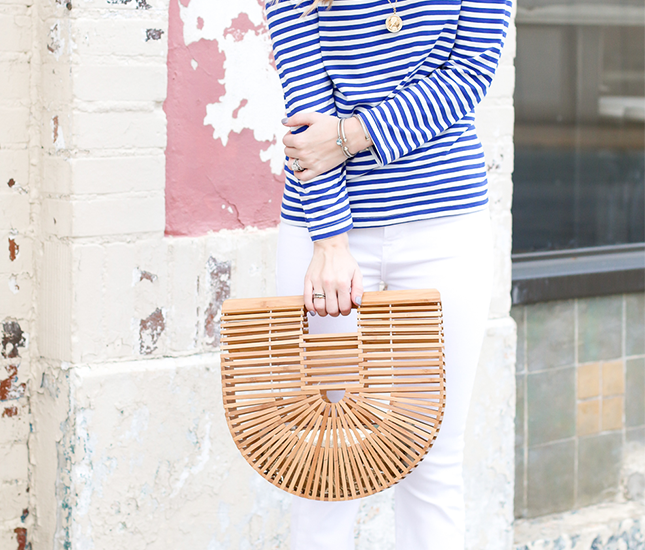 I was shocked when I came across this circle tote…and even more shocked that it’s under $50! UTILITY TOTE ($65) | Ok, so this isn’t a straw bag, but I am loving this lightweight utility tote. This is such a classic and versatile tote and I love the leather handles. TASSEL TOTE ($350) | This bag is definitely on the pricey side and I’m not sure I would purchase this one because I wouldn’t get a TON of wear out of it. But if I lived in an environment where it was warm year round I would probably invest in this bag because it’s super cute and appears to be high quality!